Go green or go home? You have two choices if you're going to celebrate St. Patrick's Day today with what's in your favorite tea mug: choose a green tea, or drink tea like they traditionally do in Ireland. And these are not the same things! While there are certainly people in Ireland drinking green tea today and all days, Ireland ranks No. 2 in the world for tea consumption (first place goes to tea drinkers in Turkey)*, and most of that tea is black. Traditionally, people in Irish prepare a very strong black tea, and serve it with milk and often sugar. 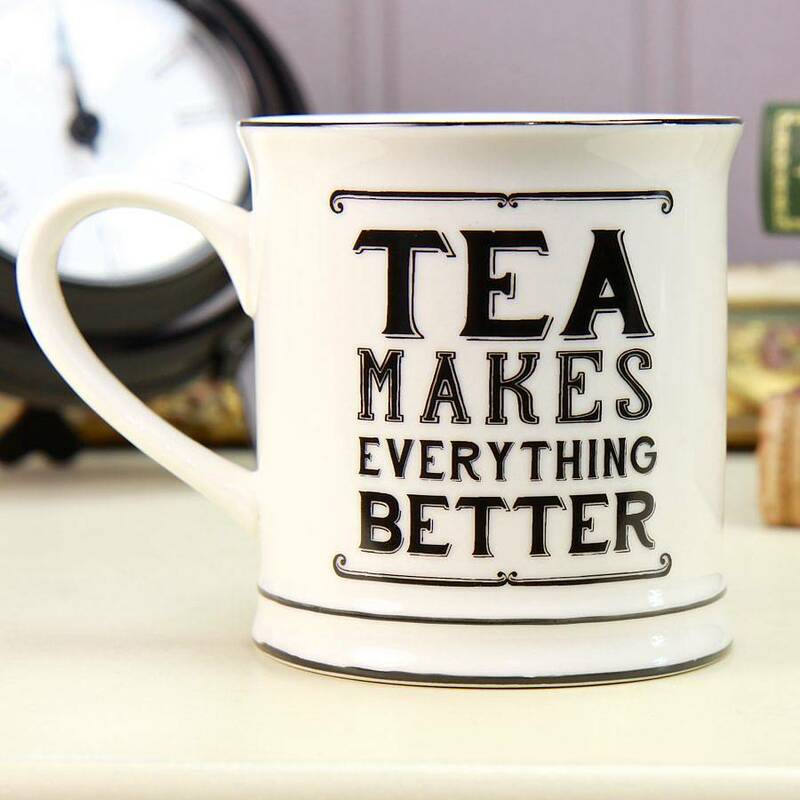 Tea wasn't introduced in Ireland until the early 1800s when the upper classes began drinking it, but it was quickly embraced by all social classes. *This info from Euromonitor International in 2014, calculated as tea imports divided by population. Particularly impressive when their data shows that would result in the Irish consuming 4.83 pounds of tea per person per year, and Turkey at 6.96 pounds per person, per year. Dang, Turkey! Leave some for the rest of us. The three traditional tea times in Ireland include Elevenses at (surprise) around 11 a.m., afternoon tea at about 3 p.m., and High Tea, which is when many pots of strong tea are served with a variety of savory and sweet dishes. The difference between Irish Breakfast Tea and English Breakfast Tea is slight, although most say that Irish Breakfast Tea has no set formula of tea blends and is generally more robust (because of how much they like to add milk) but both can be made from a mixture of tea from Assam, Ceylon and African black tea. So anyway, if you're going to drink tea in honor of St. Patrick's Day, seems like the most traditional thing to do is brew a strong black tea, and definitely add milk. 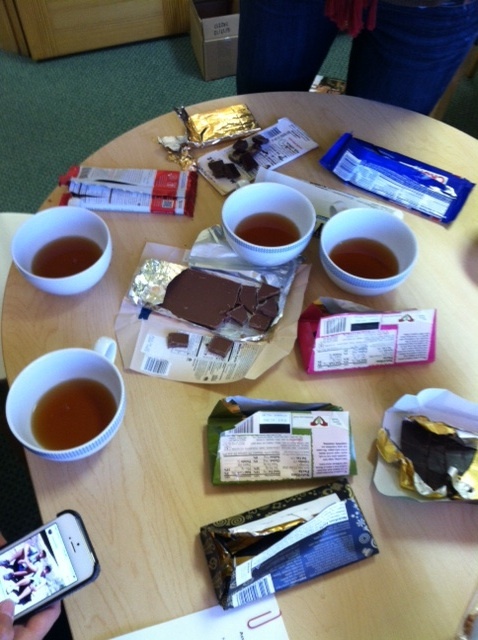 Then again, we found an article saying that matcha green tea was becoming the "new coffee" in Ireland last year. Notice how they didn't say it's the "new tea," because that would probably be blasphemy. Ah well -- at least it's green. One other thing: If you're hankerin' for some green or white tea today, we've got a sale! (Today only.) 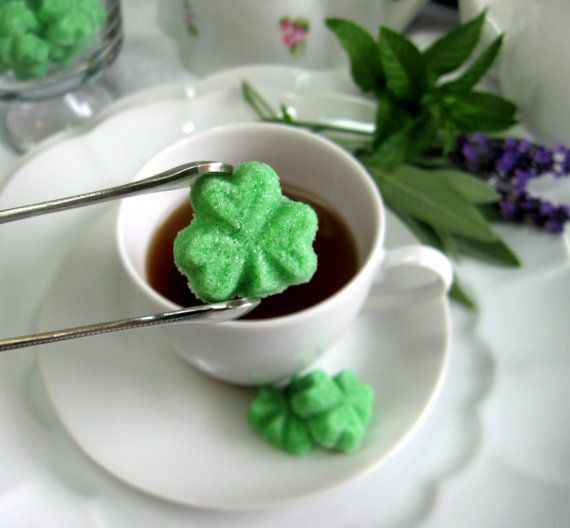 Use promo code Blarney15 to take 15 percent off any green or white teas on our website. Slàinte, whatever you're toasting with today! Happy St. Patrick's Day. When time is on your side, as it may be during a lazy summer day, maybe it’s time to try something new with your tea leaves. We have to chuckle a bit at that sentence. Can there really be something “new” with a drink that’s thousands of years old, and about as basic as it gets? 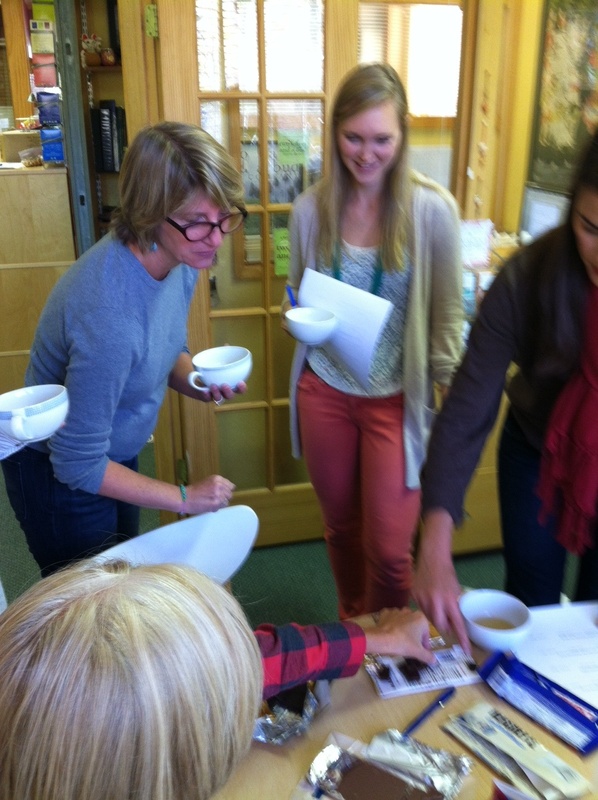 Tea is leaves and hot water … what could possibly be new? Here’s what: the temperature of the water. Lately we’re hearing a lot about “cold brew” for both tea and coffee, and it’s exactly what it sounds like: brewing tea (or coffee) for a long period of time in cold or room temperature water. Voilà! Something new. Well … or just something new to you. 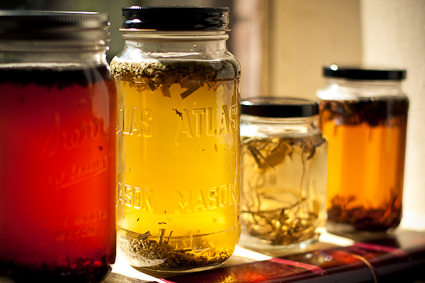 Give cold brew a shot with any kind of tea — black, green, white or herbal. There are no rules! As water moves into the coffee particles or tea leaves, it dissolves or suspends hundreds of different substances and extracts them from the solids. If the water is hot, it extracts more rapidly and completely. Hot water also cooks as it extracts, forcing chemical reactions that transform some of the extracted substances into other things, and driving some aroma substances out of the liquid. Cold water, in contrast, extracts more slowly and selectively, produces a simpler extract, and doesn’t change the original flavor substances as much. So cold-brewed teas and coffees are chemically different from their hot counterparts. They tend to contain less caffeine and less acid. 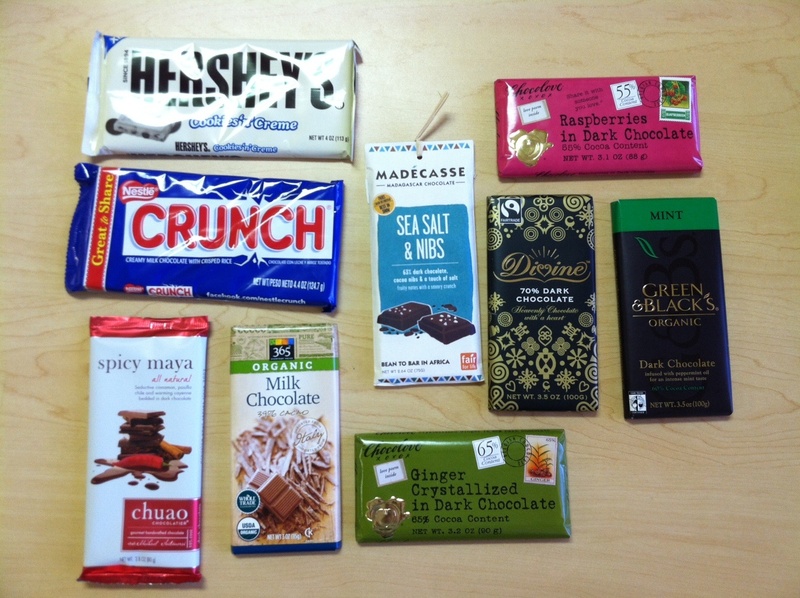 And, of course, they taste different. If the flavor of hot tea or coffee is your gold standard, then cold brews won’t measure up. If you think of hot and cold brews as different drinks, just as a lager isn’t the same as a pale ale, then you may find that you enjoy both. We went looking for someone who swears by cold brew, and we found her: Facebook fan Cady Mae says cold brewed tea is now her favorite method. Cady’s answer is six tablespoons of loose tea to two liters of water, but cold brewing tea is “new” enough in the café industry that the jury’s still out on this one — plenty of tea experts have their own ratios that they prefer. And she’s right about a lack of bitterness — hot water pulls both polyphenols and caffeine out of tea leaves, two components that are known for being astringent and bitter. Cold water, on the other hand, is able to slowly pull flavor out of the tea leaves without those other characteristics. 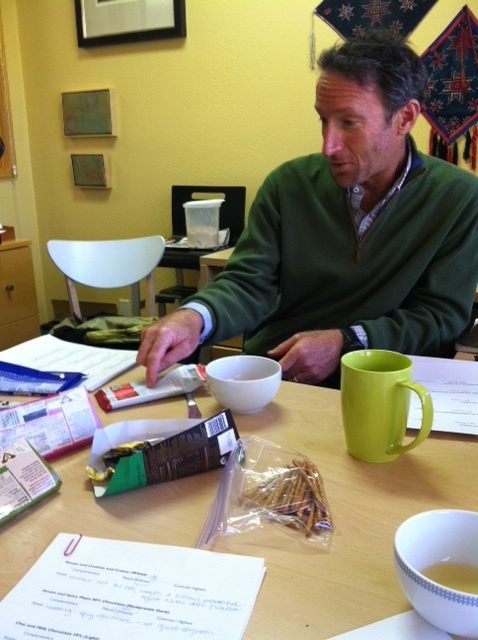 Thus, you’re more likely to notice flavors in your tried and true tea leaves you haven’t tasted before. As a recent article in Fresh Cup magazine by Cory Eldridge explains, the only real downside to cold brew (besides having to prepare it ahead of time) is the amount of space a jar of cold brewing tea can take up in your refrigerator before you drink it. Some of us tea lovers would say that’s well worth a new(ish) favorite beverage, right?! We will warn you though, tea lovers: there are some companies specially making packets for cold brew tea. We tried one of them recently, and found it to be ick. (That’s a technical tea term. Ick.) 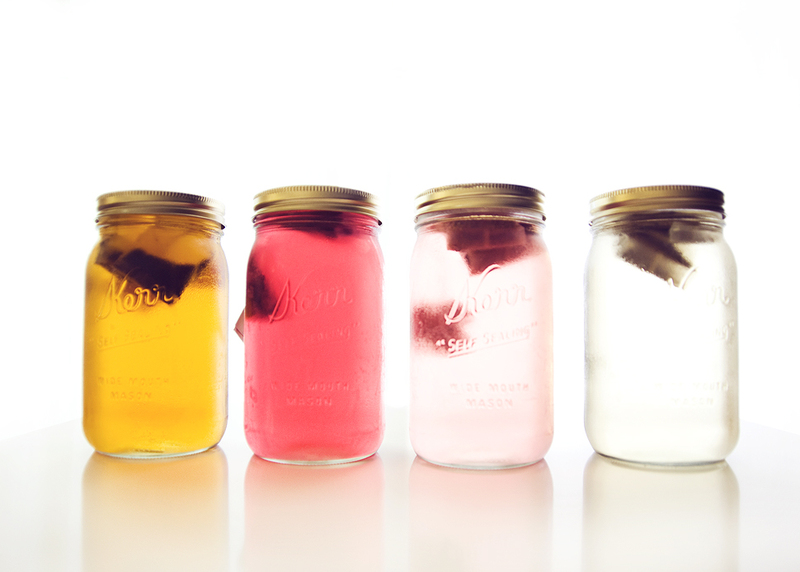 Our best advice is just to do like Cady does: Take some of your favorite loose tea, add water, and wait. Prepare to be surprised by a smoother flavor. Isn't it time your electric kettle got a little summer vacation? Let’s face it: as a blogger for this tea company, sometimes I’m just a girl with a strong Internet connection and a penchant for Googling things about tea. In a quest to provide you with interesting, relevant tea info, I decided to find out what I could about Russian tea culture and report back to all of you, since the XXII Olympic Winter Games in Sochi, Russia, begins on Friday, February 7. So imagine my surprise when, thanks to the wonder of Wikipedia, I discover that the prime tea growing part of Russia is, in fact, Sochi! Turns out that while the Russian settlement in the area was named Sochi in 1886, the first tea plantations were established there around 1903. But it took a few tries before tea was successfully grown there. In fact, it was a Ukrainian peasant named Judas Antonovich Koshman who worked for a tea factory on the Black Sea coast and who brought tea plant seeds to Sochi, (or more specifically, the sub-tropical climate of Dagomys, 30 km south of Sochi.) He developed a brand of tea which was both resistant to cold temps, and resulted in a rich taste. 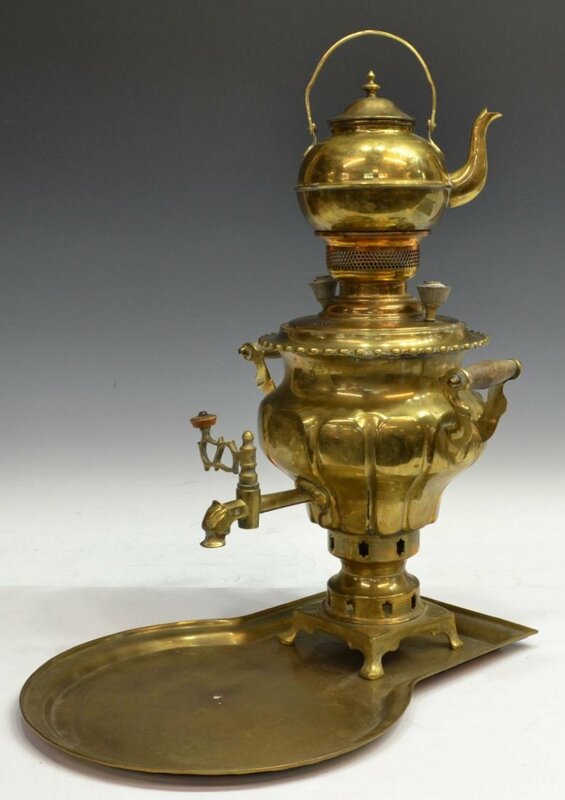 Check out this traditional Russian samovar. This tea resulted in Krasnodarsky Tea, a brand that is still the most prominent Russian-grown tea and is one of the northernmost tea plantations in the world. So the next obvious question is, how do Russians like to prepare and drink their tea? This answer is also very cool: with a samovar. 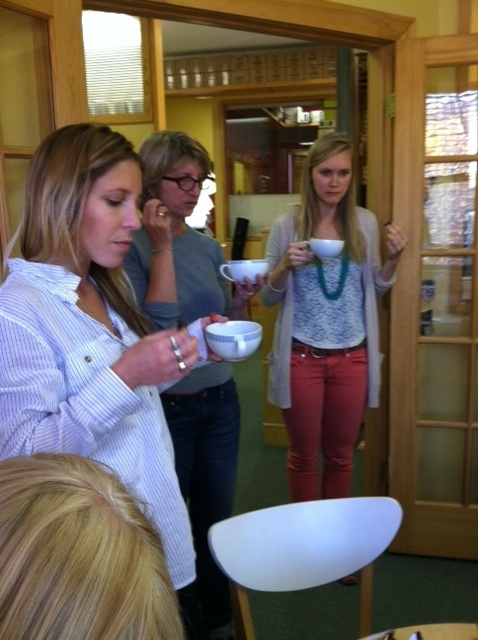 We’re posting a picture so you can admire how ornate these tea dispensers can be. Basically, it’s like an electric kettle (they used to be heated with coal or even dry pinecones) that heats water to a perfect boil. 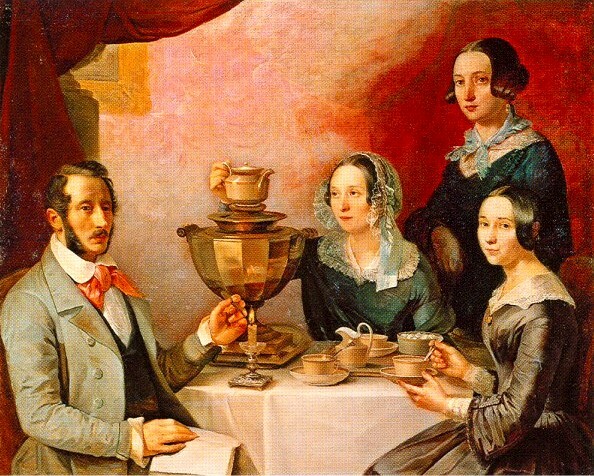 Sitting around the samovar (family portrait in 1844 by T. Myagkov). Up above the heating compartment, a strong tea concentrate is kept warm. It seems that the way to drink tea traditionally in Russia is to mix that tea concentrate with hot water, at roughly a ratio of one part concentrate to 10 parts hot water. 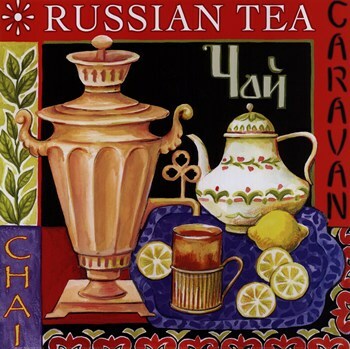 The Russian phrase “to have a sit by the samovar” means to have a leisurely talk while sipping tea. Sounds lovely. These days a samovar is seen as a symbol of hospitality and comfort. There are more gorgeous tea accouterments in Russian tea culture, like pretty tea glass holders. As for how the Russians take their tea, well, lots of different ways, but typical stir-ins include lemon, sugar or jam. We’ve got to try that! I also liked learning that in the 19th century it was popular to drink tea with a cube of sugar held between your teeth. 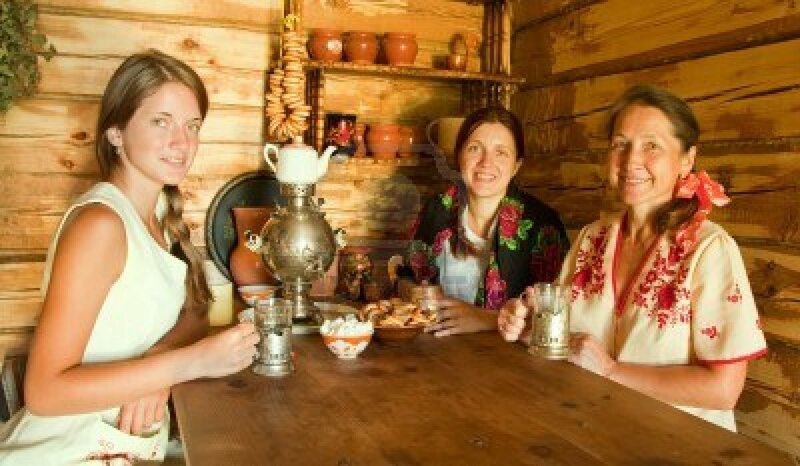 If there's a photo of tea drinking in Russia, there's usually a samovar in it. 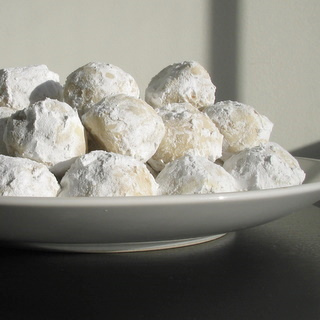 Since I think you’ll have a hard time getting your hands on some Russian tea in time for the Winter Olympics broadcast, I’ll leave you with something you can make for your Olympics-viewing tea time: Russian Tea Cakes. Fair warning that no one really knows the association between these cookies and Russia since they go by lots of names, including Mexican Wedding Cookies. Some people think the recipe may have migrated to Mexico with European nuns. Russian Tea Cakes: Probably not *that* Russian, but delicious all the same. I’ll leave you with the recipe. And let’s all agree that during the Winter Olympics, we’ll whip up a batch, nibble them while sipping tea on the couch, and reflect on the things we miss about Apolo Ohno. That soul patch just doesn’t have the same swagger to it now that he’s just a commentator, does it? Enjoy the Olympics, everyone. Cheers! Oh- in Russian, that’s На здоровье (Nahz dah-ROH-vee-ah.) Now you’ve really earned a cookie.